I just realized that I missed the second anniversary for Friday Words; I made the first post under that name on October 29, 2015. Somebody asked me the other day whether it's hard to find terms. Perhaps surprisingly, not very. Once you start listening for new(-to-you) terms or start to wonder about etymologies, it's more a matter of keeping up. Speaking of new-to-me-terms. Facebook Friend Doug introduced me this week to the, uh, colorful term Cletus safari. Aside from the cleverness of the construction, I was interested in how the term manages to be a kind of double insult. A Cletus safari is the kind of news article in which the writer makes an expedition from some enclave of sophistication—New York City, let's say—to go talk to the exotic folk out in the hinterlands to get their take on an issue of interest. Those of us who read the failing mainstream media have undoubtedly seen a hundred articles like this in the last year, in which still-surprised journalists go talk to voters in counties that voted for Trump to try to suss out what is going on with these people. 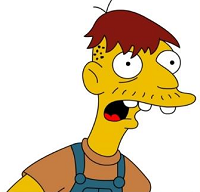 Cletus is a not-flattering term for a rural denizen—one definition in Urban Dictionary has it as "Also can be synonymous with hillbilly." (That's one of the more neutral entries for the term in that dictionary.) The word is actually a traditional boy's name, but by a kind of onomastic metonymy can be used to refer to people who might use such a (currently unfashionable) name, i.e., them rednecks. Compare Billy Bob or Bubba. I suspect that this stereotype was strongly reinforced by (or perhaps introduced by) the character of Cletus Del Roy Spuckler in The Simpsons. The world demonstrably does not need another Cletus safari into the heart of Trump’s America, but The Politico has one for you anyway. One particularly bad thing on the internet is Chris Arnade's neverending Cletus safari. I think that we can agree that Craggs is not using Cletus safari here in admiration. Anyway, think about this the next time you read another analysis in which a journalist is out talking to the general populace. As if that weren't unexpected enough, let's talk about unexpected etymologies. 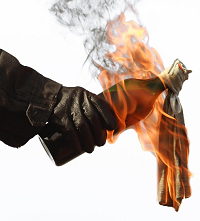 This week I was reading about World War II again and ran across a concise little history of the word Molotov cocktail. This is an improvised weapon consisting of a glass bottle filled with gasoline or kerosene, with a rag as a fuse. You light the rag on fire and throw your bomb at a convenient tank or something. Molotov was the Russian foreign minister who was doing all this negotiating, and was responsible for the propaganda that tried to sell the Finns on the Russians' offer. As the story is told, while the Russians were dropping bombs on Finland, Molotov was on the radio telling the Finns that Russians were in fact making food deliveries. The incendiary device was then derisively named by the Finns for Molotov, a "cocktail" to accompany this "food" the Russians were delivering. The Finns didn't actually invent the device—apparently that credit goes to an underequipped but clever soldier from the Spanish Civil War in the 1930s. But the Finns' sardonic name has become our standard term for the device.